By 2050, there will be several billion more mouths on our planet to feed. To keep up with the increasing demands of our growing population, we need an innovative and efficient agricultural system that is able to produce more with fewer resources. When we talk about alternative food production systems, like agroforestry and holistic grazing, the first thing we usually hear is something along the lines of “yes, but that will never be enough to feed the world”. Behind this statement is the implicit idea that that industrialised agriculture, with it’s highly mechanised, large-scale monocultures and intensive use of synthetic chemical inputs, is the ‘most efficient’ way to produce our food. But, when you take a closer look, a very different picture emerges - one of an absurdly inefficient system that is verging on insanity. What do we mean by ‘efficiency’? It might be an obvious thing to say, but it’s important to point out firstly that the idea of agricultural ‘efficiency’ relies wholly on our definition of efficiency. ‘Efficiency’ in agriculture is, for the most part, focused almost exclusively on crop yields- but this excessive focus on yields ignores a whole host of other important factors that our crop production relies on. Imagine, for example, you were only to focus on calorie intake as a measure for nutritional health of a human being. Eating pizza for every meal every day might then seem like a great idea - loads of calories, so this should make you really healthy! Right? Clearly, by eating pizza all the time, you could easily fulfil your caloric intake for the day but measuring health like this misses the bigger picture of nutritional health i.e. that humans also need a diverse variety of food types in their diet with a range of nutrients and vitamins essential for human health. Similarly, in agriculture, by focussing on only yields as a measure of success, we’re missing the bigger picture of agricultural and ecosystem health. So what happens if we start to look at efficiency from other angles? A persistent argument in favour of industrialised agricultural practices is that it produces more food per hectare- but this doesn’t hold true. In fact, smallholder farms produce 70% of the worlds food on less than a quarter of all farmlands. How do they do it? By diversifying. Perhaps industrial farming produces more of one crop per hectare, but it cannot compete with a concentration of different crops on the same parcel of land. Imagine, for instance, you were to plant three crops; say, maize, beans and squash. To get three hectares of crops, you have the choice. Either you can mono-crop each crop and have one hectare of each across three hectares. Or, you could plant them all together- the beans climbing up the maize, the squash covering the floor and the maize growing up into the sky. You can therefore produce three hectares of each crop on only one hectare. This creates what is called an overyielding poyculture. This is the classic ‘three sisters’ growing method, but the same model of thought can be applied intelligently to all crops. In an agroforestry system, such as here at Mazi, that means trees combined with other crops underneath and between the tree lines, as well as animals that graze the grass underneath the canopies. In this way, you maximise on space, time (spent walking around checking the crops), calories produced per hectare and photosynthetic efficiency (i.e. maximising light, one of the major factors that plants need to grow the sugars, carbohydrates and other compounds we need for food). Every facet of industrial agriculture, from the production of the synthetic chemical inputs it relies on, to food processing and transportation, is rooted in cheap access to fossil fuels. As Joel Salatin puts it, we are the first culture in the world that has ever put an average of 1500 miles between producer and consumer. Whereas before, 1 calorie on the table took an average of ¼ of a calorie of energy to get there, today it takes 15 calories to produce 1 calorie of food energy. This over-reliance on fossil fuels is a false economy, working only by borrowing from the future to produce for today, which makes our food system very unstable. When the day (inevitably) comes that access to fossil fuels is no longer cheap nor readily available, such as during the 1973 oil crisis, our whole agricultural system will be brought to its knees. Regenerative practices, on the other hand, rely much less on fossil fuels and much more on renewable, non-polluting resources, which makes it both more resilient and more efficient in the long term. 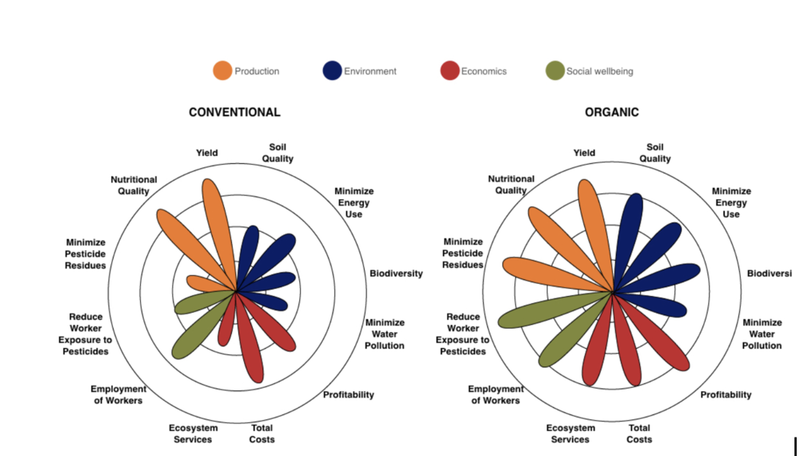 When we take a more holistic approach to agricultural costs, it becomes obvious that conventional agriculture costs much more to society than agroecological farming. You actually pay three times for your food- once when you buy the food, once through your taxes which pay the agricultural subsidies needed to sustain this unsustainable type of production, and once to negate all the negative impacts that type of agriculture creates, ranging from the healthcare costs of farm workers exposed to pesticides, to de-polluting the water we drink. In France, for instance, the contribution of the agricultural sector to it's GDP is approximately 32 billion euros per year, whilst the cost of water treatment linked to agricultural pollution is estimated to be around 54 billions euros per year! And that is just for water pollution. So, ultimately this means that agriculture as we currently do things costs us more as a society than it creates for us, which is economically absurd. We are destroying free processes, such as water and nutrient cycling, given to us by nature and we are instead investing in more and more complex and costly technologies to replace them. Here on Mazi, we like to say that we’re not culturing crops or trees, but that we’re culturing soil. Soil microbiology is the basis of the fertility of our ecosystems and therefore of our farms. The organisms in our soil play a vital role in synthesising and making nutrients available to our plants, storing and holding them until the plant needs them and then releasing them in a ready-made soluble form. Nutrients in conventional agriculture, on the other hand, are poured on by the tonne, and excess nutrients wash away, polluting our waterways and killing off marine life. Microbiology also plays a huge role in disease suppression, irrigation (water movement through mycelial connections drastically increases water uptake in plants) and soil aggregation (meaning less soil erosion). Furthermore, it creates a healthy environment in which plants can pick and choose nutrients as they need, which puts the plants back in control - and who understands plants needs better than plants? This means as farmers we don’t have to waste time and energy micromanaging every need of the plant. So what do we do in conventional agriculture? Pour fungicides and pesticides on our fields to destroy microbial life in the soil. Nice! It is often argued that despite the gains in efficiency elsewhere in the system, the fact that organic production produces less is still a barrier in a world where we are told we need to produce more food. But on closer inspection, this gap between crop yields may not be all it seems. The most extensive meta-analysis studying comparative yields to date did indeed report that, compared to conventional farms, organic production produced on average 20% less yields, echoing the ideas of previous studies. However, the report then goes onto consider this gap in more detail, breaking down the binary categories of conventional vs. organic and instead focusing attention on organic farms that practised cover-cropping, carefully managed rotations of crops and focused on building soil health - i.e. a more regenerative approach to organic farming. When weighing these factors into the equation, that gap of 20% halved to only 10%. The authors concluded that this gap may actually be even smaller due to bias in the data. Furthermore, nearly a third of all the food we produce goes straight in the bin. This means that the gap in production yields between conventional agriculture (both industrial and organic) compared with regenerative agriculture is actually less than the amount of food we throw away each year! Which really puts the concerns of yield loss into perspective.